While the charge and spin properties of electrons are widely utilized in modern day technologies such as transistors and memories, another aspect of the subatomic particle has long remained uncharted. This is the "valley" property which has potential for realizing a new class of technology termed "valleytronics" - similar to electronics (charge) and spintronics (spin). This property arises from the fact that the electrons in the crystal occupy different positions that are quantum mechanically distinct. 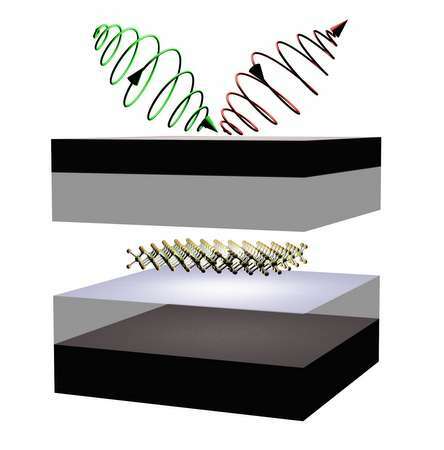 Now City College of New York physicists led by Vinod Menon have demonstrated how to manipulate the "valley" property using light by placing two-dimensional semiconductors in a light trapping structure called microcavity. This gave rise to half-light-half matter quasi-particles which have the fingerprint of the "valley" property. These quasi-particles were then optically controlled using a laser to access the electrons occupying specific "valley." The research appears in the latest issue of Nature Photonics and is a major step towards realization of "valleytronic" devices for logic gates. "Observing this property in traditional semiconductors was not easy. However with the advent of the new class of two-dimensional semiconductors, this property became accessible to manipulation," said Zheng Sun, a graduate student in Menon's research group and lead author of the paper.